October 24, 2015 Oak Bay, BC (ISN) – The University of Victoria Vikes rugby Elite Division team extended their undefeated play Saturday afternoon with a convincing 36-22 win over the Castaway Wanderers at Windsor Park, lifting the scholarly squad to a 5-0 record. Both CW and the Vikes have flexed their offensive muscle so far this season against their opponents, putting up point differentials of +87 and +110 points respectively. With both sides shored up with national experience, it was the going to be the side that was quickest to the ball that was going to come out on top. The Vikes, still feeling last year’s loss to UBC in the BC Rugby Premier Division final, aren’t afraid to admit that this season’s undefeated record doesn’t mean something. “It’s good for the guys. We still have our sights set on getting that Boot (trophy) back from UBC. It’s a sore point with us, and we want it back. We have to get to a good point where we are going to compete with UBC because they’re good”, Vikes assistant head coach Rick Farrally would comment post game. 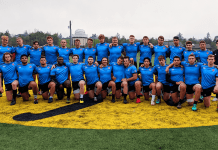 The Vikes, showcasing a speedy core of sevens players, have been near impossible to hold down through five weekends of play in the Vancouver Island Elite’s Barnard Cup play, running away in the points standings with a 9 point margin on the second place Castaway Wanderers. CW looked forward to the return of centre Ray Barkwill, fresh off World Cup duties for Team Canada, to the line up to mentor his teammates on field. The Vikes, not shy to help themselves to the first lead of the game on CW turf, would mark the board with a penalty kick in front of the posts to go up 3-0. 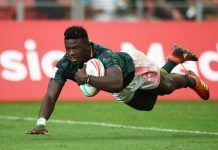 The Tricolors, with a quick answer, would see the first try of the game be awarded to the home club after Anton Ngongo would intercept and take advantage of a rare errant Vikes pass to run the sideline for the go ahead try (5-3). With that Castaway Wanderer score, the university Vikes squad, perhaps in a “call to arms” effort, would run off the next twenty-six unanswered points on trys by Grady Bowd (2) and Oliver Nott to take a 29-5 lead at the half. Sevens standout Crosby Stewart would dictate a relentless pace for his Vikes side in the first half, drawing multiple tacklers attention on runs down the wing spreading the field, and keeping play in CW’s end for the better part of the half. The Castaway Wanderers, determined to make a game of it on home turf, would be the quicker team to the ball in the second half. CW would find their scoring touch on trys by imports Regan Crossland, John Braddock. Braddock would score carrying the ball from the Vikes 10 yard marker in a rolling a maul to push UVic back, and put his team nearer with five minutes remaining in the game and a 29-15 score. Despite the CW effort, UVic would answer the bell minutes later with a try by first year Vike Bhiamie Williamson. Williamson, carrying two tacklers and the ball would stab the ball across the line in an “all-heart” effort for the try to extend the Vikes lead to 36-15. Castaway Wanderers would score a last second, final try in a too little, too late effort as the UVic Vikes would take the 36-22 result. In the penalty kick department, UVic would go 1-4, while Castaway Wanderers would not be afforded a boot advantage all game. Next weekend, October 31st, both teams travel for regional play. UVic will visit Colwood to play the Westshore RFC, while the Castaway Wanderers meet with James Bay.